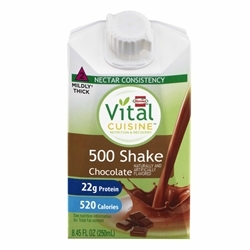 Vital Cuisine® 500 Shake Chocolate delivers 520 calories and 22 grams of protein in each carton. They are also nectar thick for those with swallowing difficulties. Ingredients: reduced fat milk, water, maltodextrin, milk protein concentrate, canola oil, sugar, contains 2% or less of cocoa powder processed with alkali, stabilizer (sodium citrate, sodium phosphate, sodium hexametaphosphate, ascorbic acid, carrageenan, maltodextrin), propylene glycol, soy lecithin, xanthan gum, ethyl alcohol, natural and artificial flavor, ascorbic acid, gellan gum, carrageenan, modified food starch. Contains: Milk, Soy.